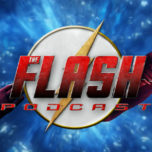 On this week’s The Flash Podcast, Andy, Amy, and recurring guest host Jason get together to review 2.18 of The Flash titled “Versus Zoom” as we finally discover the origin story of this season’s big bad, Hunter Zolomon a.k.a. Zoom! The gang also read listener feedback about “Versus Zoom” before getting to the preview session for next week’s episode titled “Back to Normal”. That and more on the latest episode of The Flash Podcast! Web Shows: Subscribe to DC All Access on YouTube which Jason hosts with Tiffany Smith with new episodes coming out every Tuesday with exclusives on the world of DC Comics! Podcasts: Check out Jason’s comic book podcast Geek History Lessons, co-hosted by Ashley Robinson (good friend of The Flash Podcast) which you can subscribe to on iTunes and Stitcher Radio!